* comparative studies in telephone and satellite policy. Collectively, the contents of this volume assess key issues for scholars, policymakers, and practitioners. 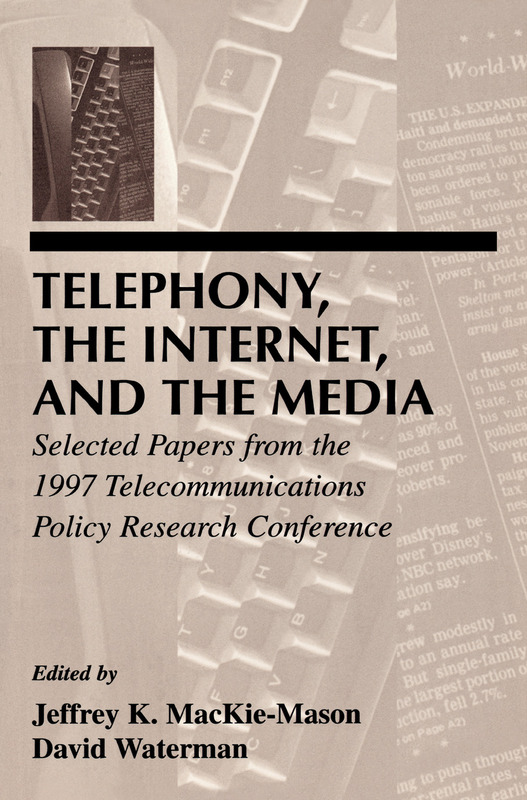 Research reported in this volume illustrates the continually expanding scope of scholarly concerns about the telecommunications and information industry and contributes to further policy research and analysis. "…the level of discourse and analysis is as high as ever--this is some of the best work done in the United States." Contents: J.K. MacKie-Mason, Preface. J.K. MacKie-Mason, D. Waterman, Introduction. Part I:Historical. B.M. Owen, A Novel Conference: The Origins of TPRC. Part II:Telephony. F. Gasmi, J-J. Laffont, W.W. Sharkey, A Technico-Economic Methodology for the Analysis of Local Telephone Markets. J.A. Molka-Danielsen, M.B.H. Weiss, Firm Interaction and the Expected Price for Access. D. Galbi, The Implications of By-Pass for Traditional International Interconnection. M. Scanlan, Call-Back and the Proportionate Return Rule: Who Are the Winners and Losers? Part III:The Media. H.A. Shelanski, Video Competition and the Public Interest Debate. A.J. Campbell, Lessons From Oz: Quantitative Guidelines for Children's Educational Television. D.W. Sosa, AM Stereo and the "Marketplace" Decision. Part IV:The Internet. D.D. Clark, A Taxonomy of Internet Telephony Applications. L.W. McKnight, B.A. Leida, Internet Telephony: Costs, Pricing, and Policy. D.L. Burk, Muddy Rules for Cyberspace. L.F. Cranor, J. Reagle, Jr., Designing a Social Protocol: Lessons Learned From the Platform for Privacy Preferences Project. Part V:Comparative Studies in Telephony and Satellite Policy. H.E. Hudson, The Paradox of Ubiquity: Communication Satellite Policies in Asia. R.B. Horwitz, Participatory Policies and Sectoral Reform: Telecommunications Policy in the New South Africa. W. Grieve, S.L. Levin, Telecom Competition in Canada and the United States: The Tortoise and the Hare.